Recruiters are struggling to find right talent in the field of Angular technology. Sometimes they are unfamiliar with best sourcing and screening tools or just stuck with technical interview questions. They could not decide on what interview questions to ask to properly evaluate knowledge of Angular developer. Here, this article offers a set of insightful questions to help you identify amazing AngularJS developers who are experts in their field. Before jumping in the questions, let’s take a look at what skills you should look for in an AngularJS developer and in case you want to leave things to professionals you can use our Angular JS Online Test. 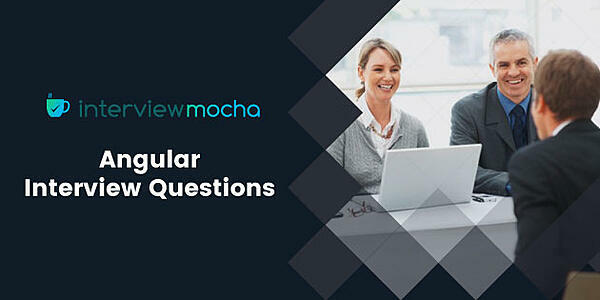 Interview Mocha also has a vast library of 1000+ other online assessment tests that can be used. Below are the must have skills you should look for when hiring an AngularJS developer. Good understanding of MVVM and MVC. Lastly and maybe most important. An Angular developer might very well become the main communication node of your team. They will need to constantly cooperate with the back-end team, the HTML coders, and the designers. See whether the candidate can explain technical concepts effectively to coworkers, and less technically savvy clients. Make sure your AngularJS developer is an outstanding problem solver with communication skills who is capable of taking your applications to the next level. Now here is the list of AngularJS interview questions for experienced. Read them, bookmark them, comment on them, or even contribute your own. 1. Mention some AngularJS directives and their purpose. 2. How to create Directive using AngularJS. Give an example. 3. Can we use the open-source Closure Library with Angular? How? 4. How could one create a single-page application using AngularJS? Which provider is used to achieve this objective? 5. Explain how MVC is achieved with AngularJS? What are the benefits of client-side MVC, in general? 6. What is restrict option in directive? Can you define multiple restrict options on a directive? 7. What are the differences between AngularJS module's Service, Provider and Factory? How can the attached controller look like, to show an alert window when clicking on the button? 9. What is the difference between “.$digest()” and “.$apply()”? Why would you ever call “.$digest()” on a scope? 10. Explain AngularJS boot process. 11. How can be the permission denied errors handled with AngularJS? Explain with example. 12. At framework level, how does Angular retrieve the matching elements for processing? Give example. 13. List a few ways to improve performance in an AngularJS app. 14. Can we have nested controllers in AngularJS? In the case of nested controllers, does the $scope object is shared across all controllers? 15. With which methods you can bootstrap your angular app for multiple modules? Explain the methods in detail. 17. What is dependency injection and how does it work in Angular? How does DI benefit in Angular? 18. What is routing? How can we implement routing in Angular? 19. How does Angular JS know when to perform dirty checking and update DOM output? 20. How can we dynamically create forms in Angular? 21. What are the different custom directive types in AngularJS? How can custom directives be applied to an element as well as attributes? 22. Describe an approach to testing directives. 23. Explain $q service, deferred and promises. 24. What is Isolate Scope and why it is required? 25. Which means of communication between modules of your application are easily testable? 26. With more than one ng-app in an HTML document (an HTML page), are they automatically initialized? Describe the AngularJS application initialization process with multiple ng-app in an HTML document/page. 27. How to do Language Internationalization in AnglarJS? 28. Explain digest life-cycle in AngularJS. What happens when you do the changes to the scope outside the angular context? 29. What is the difference between Angular and Polymer? What problems does Polymer solve that AngularJS has not or will not? Are there plans to tie Polymer in with AngularJS in the future? 30. The most popular e2e testing tool for AngularJS is Protractor. There are also others which rely on similar mechanisms. Describe how e2e testing of AngularJS applications work? Ask questions on Angular 2.0, Angular 4.0, AtScript and it’s up gradations. Asking questions on up gradations or upcoming technologies gives you a better idea of candidate’s passion for technology. Here I have mentioned few Angular 4 questions you can ask to hire Angular developers. How to include an external css in Angular 4? How Angular 4 is different from Angular 2? In which directory all external modules and files are stored in Angular 4? How to Handling Error and Logging it? How to Set Http Request Header in Angular 4? What Is Angular CLI? How To Update Angular CLI? How Google Handles Security in Angular 4 Applications? What is Typescript and how will it be useful in Angular 4? What is Dependency Injection (DI) in Angular 4? What will happen if you import the same module twice in Angular 4? This blog covered a wider spectrum of skills and knowledge that would historically be expected from AngularJS professionals. A great Angular developer is perhaps more of an engineer. It is expected from the developer to be proficient with the environment of AngularJS, but experience and an understanding of the wider ecosystem of the application should be a requirement. You are a hiring manager or recruiter and want to have a better talent pool to select from. Weed out the irrelevant candidates with poor technical skills with the help of online angularjs tests. You can easily filter out the candidates based on actual performance with pre-employment skills assessment tests.Our online assessment tools for recruitment & selection provide the best features like web proctoring, window violation, and powerful reporting that helps you find quality candidates. AngularJs Online Test – Evaluate AngularJS skills like Services, Templates, Expressions, Interpolation, Directives and Modules. Authorization, Angular 2 Components, Functions and Applications. 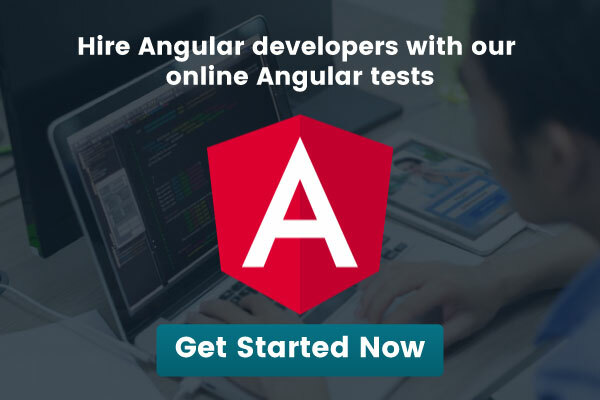 Angular 4 Online Test- Quantify candidate skills like Angular Animation, Performance Optimization, Angular Universal, Directives, Modules, Data Binding, Templates, Routes, Version Upgrade, Form Handling. If you have any question on AngularJS or piece of advice to share, please let us know in the comments below! 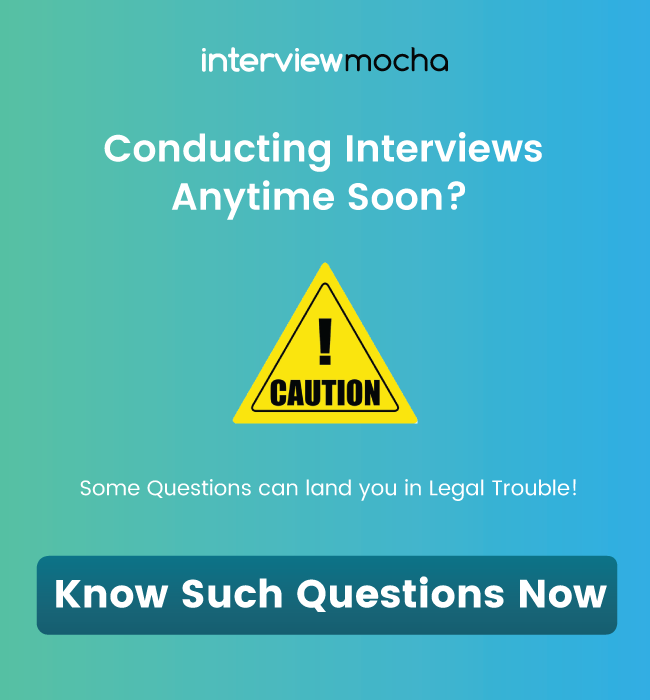 There is more to interviewing than tricky technical questions, so these are intended merely as a guide. You are a hiring manager or recruiter and want to have a better talent pool to select from. A well-planned hiring process and the perfect pre-employment-testing-software is what allows you to find and keep a master AngularJS developer.